I picked up Halo Spartan Assault for a few bucks when it was on the Steam Sale the other week. I didn't really know anything about it, but I've had fun in the Halo universe many times in the past so I figured it couldn't hurt. Well, I played it and found a fairly mediocre twin-stick shooter. It plays fine with either mouse+keyboard or gamepad. It's set in the Halo universe. You move with one stick and shoot with the other. All the weapons and enemies are themed on Halo. I guess I was expecting more. It truly underwhelmed me. If you're a die-hard Halo fan who loves twin-stick shooters then this game is perfect for you. If you're anyone else you shouldn't waste your money here. 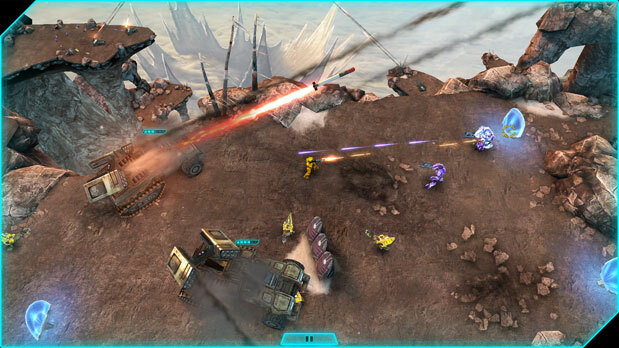 "If you're a die-hard Halo fan who loves twin-stick shooters then this game is perfect for you." That billing fits me pretty well and I was still too bored to finish this game. I wish they would do a sequel to the Halo RTS and bring it to PC. People lampooned it at the time for being a console RTS, but it worked well. Besides, no one makes RTSes on the PC anymore either, so I'd love to see even a "dumbed down" one. It seems like a RTS would be a much better fit for the PC than a Twin-stick shooter. Personally, I just wish they would port the whole Halo series to PC. I played all the games on Xbox and Xbox 360 but I don't see myself getting an Xbox One anytime soon. Microsoft should just put Halo out on their console and their PCs.